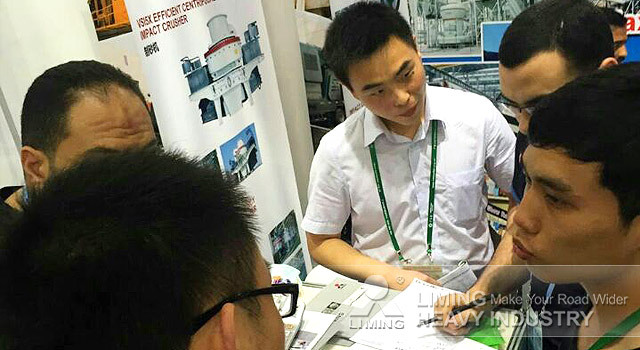 Liming Heavy Industry attracted much attention in the 119th Canton Fair. Recently, the 119th Canton Fair has been held on April 15-19, 2016 in Guangzhou, China. 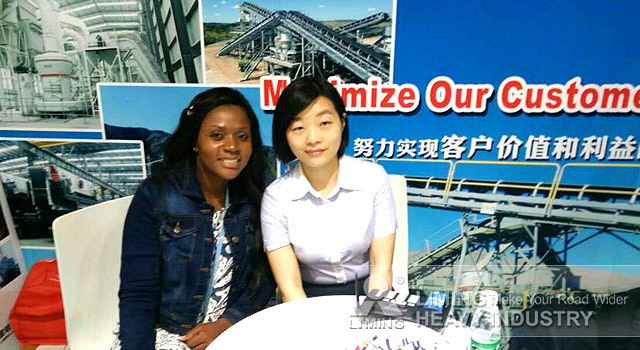 In the Canton Fair, Liming Heavy Industry attracted much attention of mining customers all over the world. Liming Heavy Industry showed K Series Mobile Crushing & Screening Plant, PEW European Type Jaw Crusher, HPT/HST Hydraulic Cone Crusher, PEW European Type Impact Crusher, VSI5X Vertical Shaft Impact Crusher, MTW European Trapezium Mill, LM Vertical Mill and other mining crushing and grinding equipment in an all-round manner for customers. These equipment are very popular in the mining industry. For the exhibition consulting customers, our professional technical and sales staffs give the professional, honest answer four them. We made a commitment to our customers: The customer who signed a contract directly in the exhibition will give a 1% -5% discount immediately. Some customers signed a contract on the spot. There are many customers expressed that they will come to our factory to visit. Welcome more customers to visit our company!